I find really interesting the report released by security firms regarding the principal cyber threats and the related evolution. 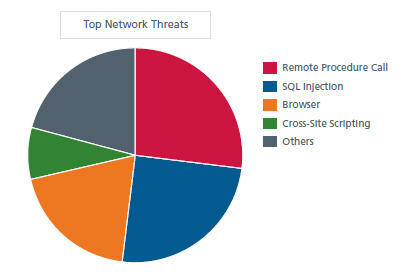 This time I desire to share the data proposed in the by McAfee Labs in its McAfee Threats Report – First Quarter 2012. 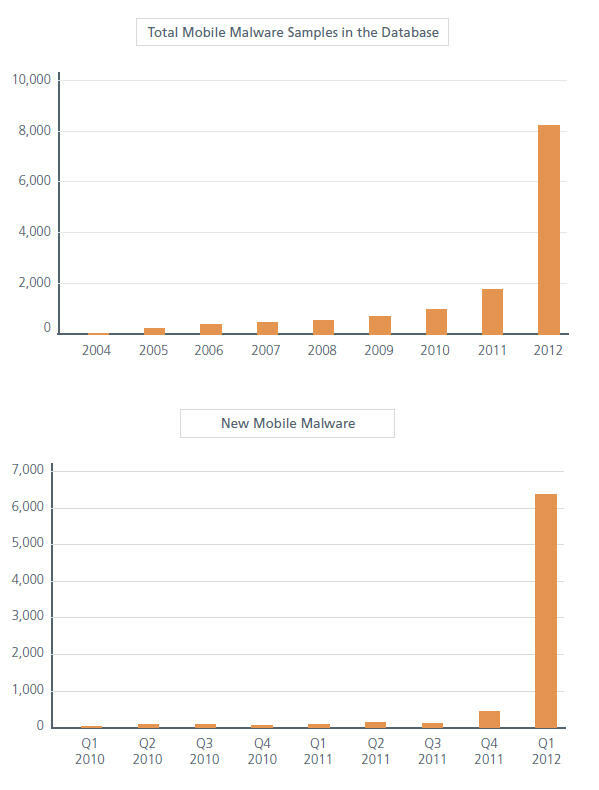 Let’s start observing that this first part of year have registered an impressive increase of the malware diffusion, the experts believe that the trend of growth will be consolidated during the current year, and the area which could suffer more the incoming cyber threats will be the mobile. The number of malware in mobile environment has quadrupled respect the last year and the almost all of the agents isolated are new and related to the Android OS based devices ( 87%). The principal reason of the rapid diffusion of malware is related to the download from third-party app store, mainly from Russia and China. The main purposes for the malware diffusion are the realizzation of frauds by cybercrime and cyber espionage for governments. Backdoor Trojans are the most dangerous threats because using root exploits they could allow a total remote control of the victim device. 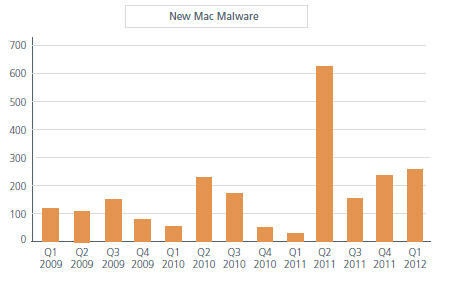 Very worrying is the situation related to diffusion of malware for PCs and Macs with more of 83 million malware samples detected that represents the biggest number in the last four years, and increment of 10% in just one quarter. 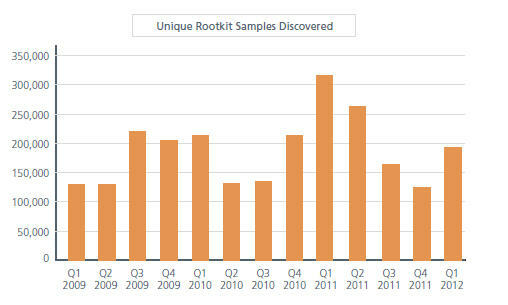 Within malware categories has been detected a sensible increases in rootkits, password stealers and more in general in signed malware, a growth that is expected to be increasing during the rest of 2012. The principal vector used for malware spreading is the email, largely adopted for massive phishing campaign and also for targeted attacks. 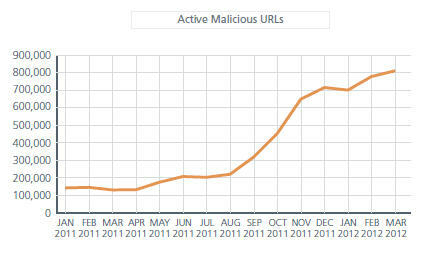 Consider that spam levels reach record lows at the end of 2011, meanwhile in the first part of the year has been detected a spike, but the situation is slowly returning to normal. The spike has been originated mainly from China, Germany, Poland, Spain,and the UK. Over tha phishing schema the experts of McAfee have provided an alert on the increase of the number of websites hosting malicious downloads or browser exploits. This infection schema is really common and has registered a sensible growth as showed in the following picture. Among the malware, as noted, the most active and dangerous are the rootkits which provides an enhanced capability by accessing, adding code to, or replacing portions of the core operating system. The rootkit operate is stealthy mode to gain privileged access to the victim machine, hiding its presence to the ordinary security platforms. Many time a rootkit attack is configured in conjunction with well know trojan, such as Trojan.Koutodoor, that may download more files and install a rootkit component on the compromised machine. In this first part of the year Apple computers have been addressed by several malware, it has been registered an increment in the development of virus and trojan able to attack devices of the famous brand. To aggravate the situation there is the belief of many Mac users that their systems are immune to such threats, thus favoring viral spread of malicious applications. One of the more aggressive malware is Flashback Trojan, a malware created to conduct click fraud scam by hijacking people’s search engine results inside their web browsers, stealing banking or login credential. Of course one infected the system it could be used ad part of a botnet causing bigger damages. The botnet related to the Flashback Trojan is called Flashfake also designed by cyber criminals to conduct a click fraud scam, taking advantage of pay-per-click campaigns by advertising companies. Flashback was created in September 2011 to disguise itself as an Adobe Flash Player installer, using Flash player layout. Once installed the malware search user names and passwords stored on the victims. Meanwhile Fake Antivirus and other bogus security software, AutoRun and password-stealing are still creating many problems the category of signed malware is generating a lot of concerns. Installation for certain types of software could needs that its code is digitally signed with a trusted certificate. By stealing the certificate of a trusted vendor reduces the possibility that the malicious software being detected as quickly. That is exactly what happened for Stuxnet virus and for any signed. This quarter more than 200,000 new and unique malware binaries have been detected with a valid digital signature. This technique has been already used to make more efficient cyber weapons such as Duqu and Stuxnet, is expected that the same approach will be adopted for future malware development, in cyber warfare scenario and by cybercrime. The report alerts on the botnets diffusion observed in the last months, millions of compromised computers connected to the Internet are daily used to realize scam and cyber attacks. Observing the volume of messages exchanged between bots and command server is possible to have an indicator on the level of the threat and its diffusion. Overall messaging botnet growth jumped up sharply from last quarter, mainly in Colombia, Japan, Poland, Spain, and the United States. Many of the leading messaging botnets (Bobax, Cutwail, Grum, Lethic and Maazben) showed a minor growth or a decline with the exception of Cutwail botnet which increased significantly. Behind the principal botnets there is the cybercrime industry that is pushing on the diffusion of malware to infect an increasing number of machines but also proposing new models of business, such as botnet rental or the commerce of the agents for botnet creation. The business is reaching important figures in a short time mainly due to the opportunities provided by the Deep Web. The report addresses also “Network Threats” and “Web Threats” identifing the major cyber threats related to the registered cyber attacks, RPC, SQL Injection and Browser attacks are the most common threats. The report closes with a reference on hacktivism and related impact on cyber security. The events connected with this new type of protests worry more and more and the resulting actions must necessarily be considered among the main threats in recent years. The scenario illustrated by McAfee shows a worrying trend in growth common to all major threats. Cybercrime and hacktivim concern especially for the volume of users impacted, while cyber threats associated with government projects are proposing new alarming techniques of offense that could be share in the future also by criminal organizzations. We must monitor the growth and spread of threats to be able to mitigate their effects.